On Tuesday, October 23 from 8 am until Noon there will be a campus-wide active shooter drill at Sandhills Community College. This exercise will simulate, as much as possible, an active shooter response from local law enforcement, fire departments, and EMS. All areas of the college will be included, and all faculty, staff, and students will participate in the drill. The morning will be very realistic with simulated gun noise, loud commands, alarms, sirens, and evacuations. Like a fire alarm drill, this exercise is meant to ensure that the Sandhills campus is well-prepared in the event of an actual active shooter emergency. Classes will not be canceled for the exercise. A few days before the drill, signs will be placed on Airport Road and near the Airport Road/Highway 22 round-a-bout alerting passersby of the event. Because there will be many law enforcement, fire, and EMS vehicles, the public should be aware that this is a drill, not an actual event. “The best thing to do is to empower everyone to do what they feel most comfortable doing, without fear of subsequent repercussions or recriminations,” said Dr. Matthey Szajnkrycer, an emergency physician the Mayo Clinic. Classrooms at the college have posters on bulletin boards reminding students of this recommendation with details shown. If an incident is not in their immediate area, students and employees are advised to run. The classroom posters remind them to have an escape plan, evacuate the area leaving belongings behind, help others if possible, and to not move wounded people. If a shooter is too close to for them to flee, students and employees are to shelter in place, to hide. They are to get themselves out of the shooter’s view, lock and block doors, figure out options for movement, silence their phones, and be very quiet. If running or hiding is not an option, the last resort is to fight if their life is in immediate danger. Individuals are to act aggressively, incapacitate the shooter if possible, throw objects, yell, and call for help. People are to call 911 when they are safe, and when law enforcement arrives, they are to follow instructions, drop any object they may be holding, and keep hands visible at all times. 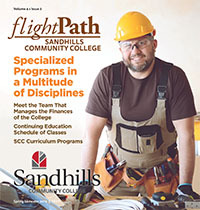 When curriculum students apply to Sandhills, they provide the college with a contact phone number. Curriculum students are provided a college email account. In the event of a campus emergency, the provided phone numbers are called, a text message is sent, and an email is delivered. This is also true of all college employees personal phones, office phones, and email accounts. Continuing Education students are encouraged to provide emergency contact information, including cell numbers and email addresses, during their registration process. All Continuing Education instructors are informed of emergencies through the college alert system, and instructors will make every effort to inform students. Continuing Education students who are in the notification system will also be sent texts and called. The college has numerous loudspeakers installed throughout campus for use in the case of an emergency.